Chetham’s Keyboad Department has enjoyed a high profile summer of music making. Its sixteenth annual International Piano Summer School saw sixty international artists on the faculty including alumni Peter Donohoe and Leon McCawley, and internationally acclaimed performers Peter Frankl, Dmitri Alexeev, Noriko Ogawa and Steven Osborne, to mention only a few. Several emerging young artists shared music across the School, with Young Artists’ recitals including performances from former Chetham’s students Caterina Grewe and Julian Clef. Caterina has just made her debut recording of Schumann, and is a top prize winner in several international competitions. Julian performed Beethoven’s first concerto at the Barbican in January and will embark on an extensive tour of his native India next month. Meanwhile, current students celebrated success in examinations and competitions. The Rosario Marciano Piano Competition is a major annual competition organised by the Vienna International Pianists Association. Year 13 student Susanna Braun, who is taught by Helen Krizos, was awarded third prize in the 2016 competition, held in the Erbhar Concert Hall in Vienna. Susanna will perform with other soloists in Chetham’s Lunchtime Recital at St James’s Church in Piccadilly, London, on Monday 28 November. 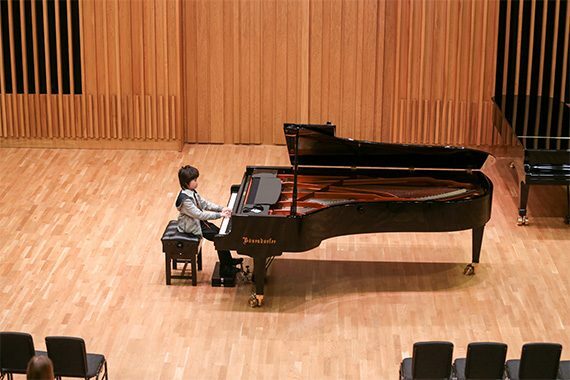 At the other end of the School, Year 4 student Leo Bailey-Yang, aged 8, became the youngest person ever to gain a Performance Diploma in Piano from Trinity College London. Performance Diplomas are one of Trinity’s most advanced performance awards, more often taken by graduate level students, and are based around an advanced recital performance. Leo passed with a superb mark of 92%, gaining him a distinction, and now continues his studies at Chetham’s with Simon Bottomley. He also played his part in inspiring young pianists in a recent edition of CBeebies Let’s Go Club, talking about his instrument, his trip to New York’s Carnegie Hall, and of course, his School! Finally, three members of Dr McLachlan’s family saw success at the Scottish International Youth Piano Competition, held at the Royal Conservatoire of Scotland in July. Sons Callum, 17, and Matthew, 16, were awarded first and third prizes in the Senior Category, whilst daughter Rose, 14, gained first prize in the Junior Category. Rose also won the £900 special overall prize as the most exceptional pianist in both senior and junior sections of the competition. All three are students at Chetham’s and Callum may be heard performing Liszt’s Piano Concerto No. 2 with Chetham’s Symphony Orchestra on Thursday 20 October. This summer, both Matthew and Callum were awarded the highest diploma from Trinity College – the FTCL, equivalent to a finals recital at conservatoire, whilst Harry Knott was awarded the LTCL, Henry Cash the LRSM and Varvara Manichuick and Mark Englander the DIP ABRSM.